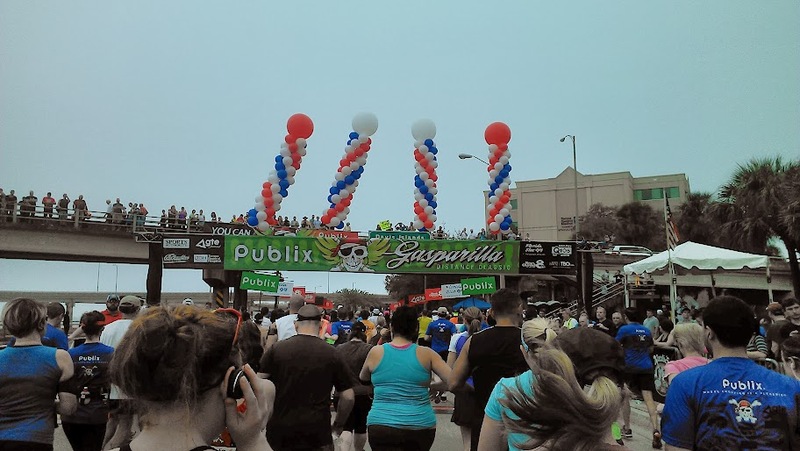 Disclosure: I received a Gasparilla Distance Classic Mic Ultra Lime Cactus Mini-Challenge in exchange for my honest review and to assist with the marketing of the event. 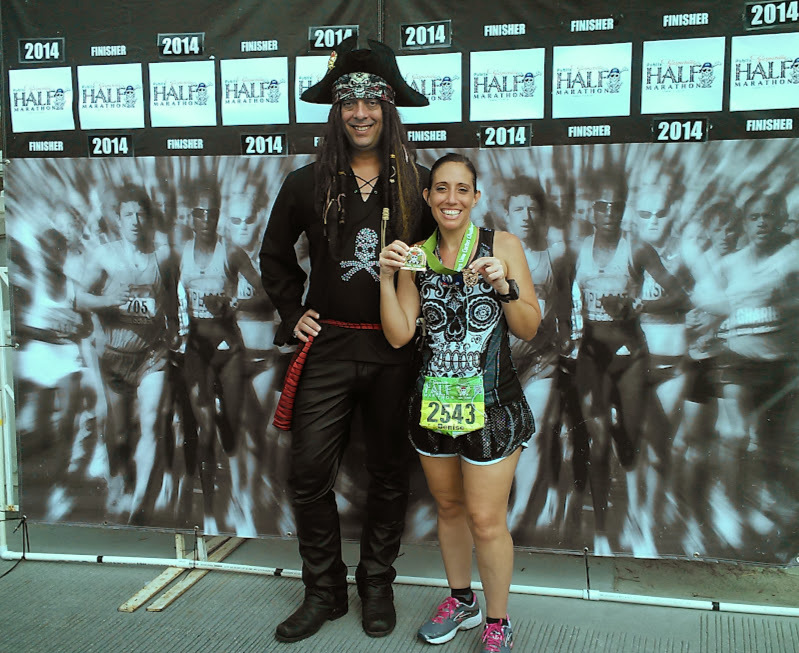 As long as I can run, I will always participate in the Gasparilla Distance Classic Race Weekend, our beloved pirate-themed race. 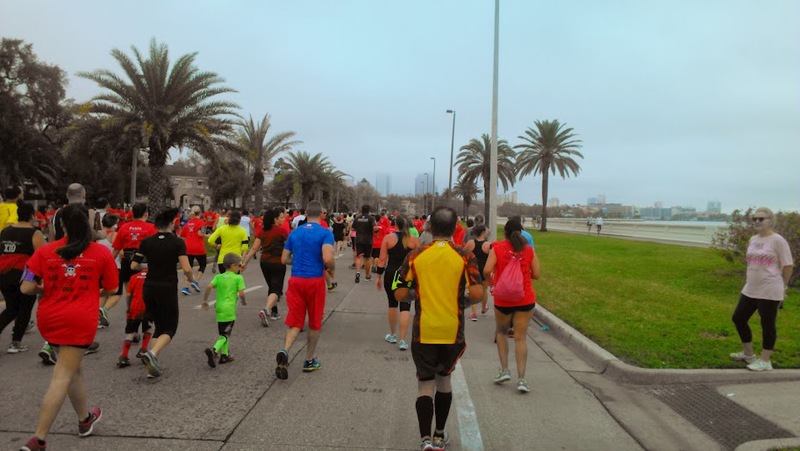 In its 36th year with over 30,000 participants, I’m not the only who hearts the Gasparilla Distance Classic. 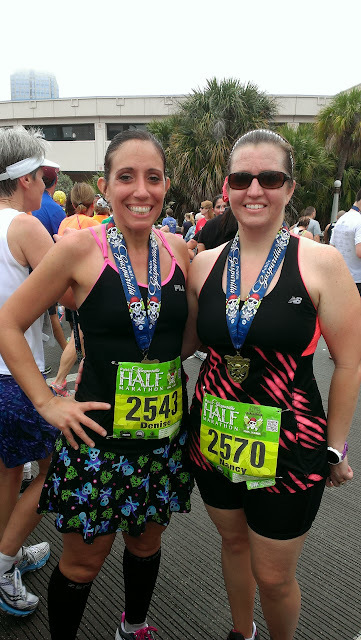 Last year, I ran the half marathon; the year before I ran the 15K. 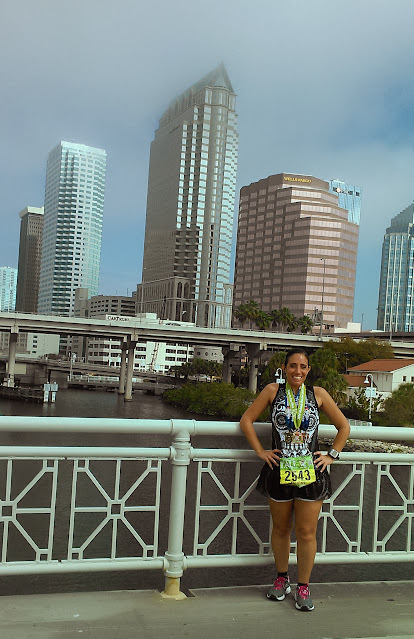 This year, I wanted to challenge myself, but since Gasparilla race weekend followed only one week after A1A marathon, I didn’t want to push myself too much. 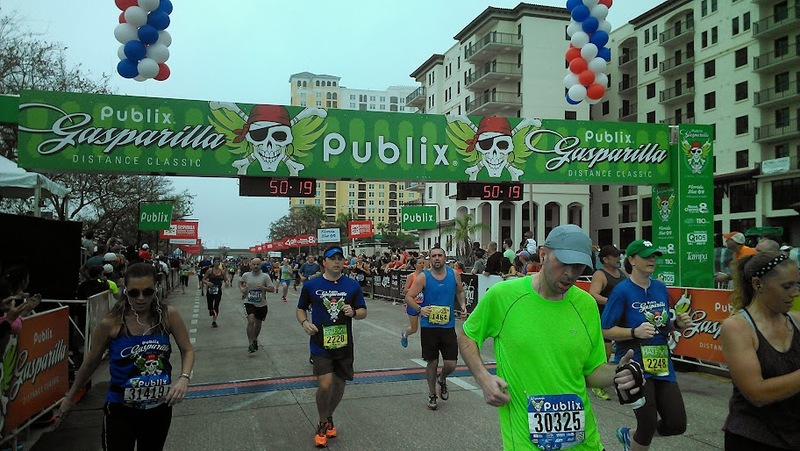 Rather than trying to beat my previous Gasparilla half marathon time, I decided to not only try to beat my previous 15K time, but to take it one step farther by going for the Mic Ultra Lime Cactus Mini-Challenge. Running 9.2 miles on Saturday and 5 miles on Sunday seemed pretty manageable. But I didn’t account for my daughter wanting to run the 5K on Saturday as well. 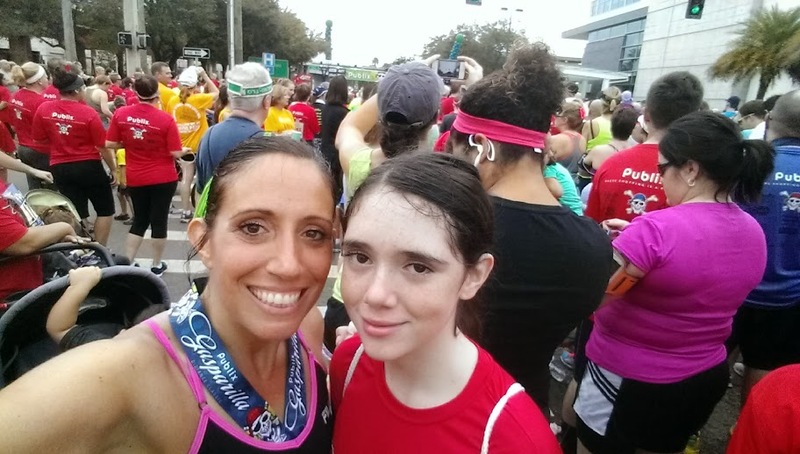 Being that it was her first Gasparilla Distance Classic experience, I wanted to run the 5K with her. Sadly, there’s no challenge for all the running I would endure that weekend but I was o.k. with that. Friday, my mom, my dad and Little Lion Man visited the 8 On You Side Fitness and Health Expo with me. We arrived later than I wanted and the lines were so long, however, my parents and I divided and conquered to save time. 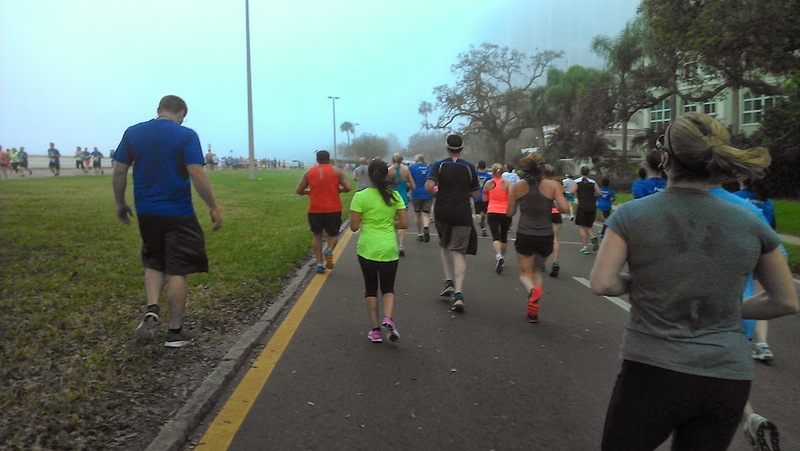 Thanks to the happy runners around me, my challenge line felt like the express lane. 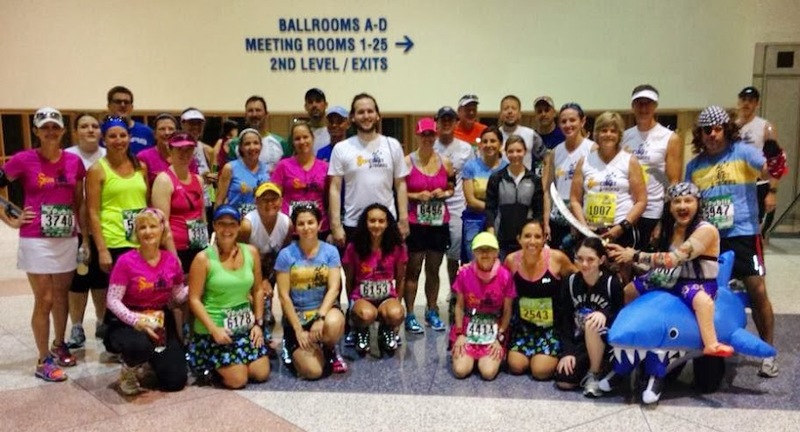 As we chatted about past races, races on our bucket list and shared tips with one another, the wait seemed to fly by. Before I knew it, I had my bib, my fancy new Lime green jacket and shirts and on my way to samples and shopping. 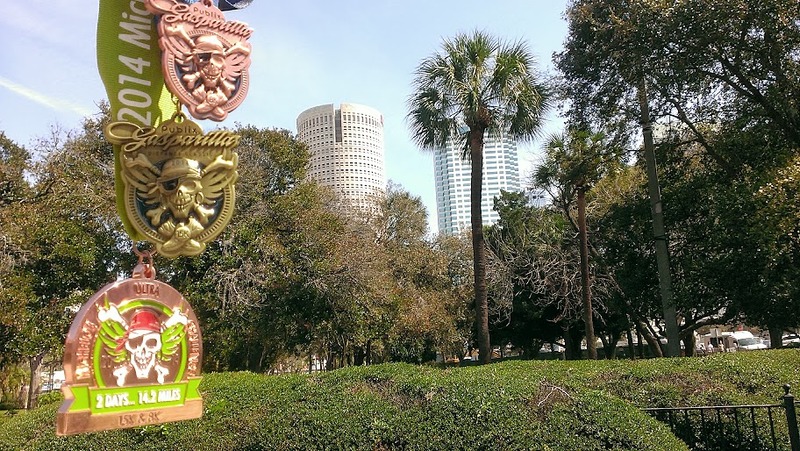 The Gasparilla Expo is almost as fun as the race. 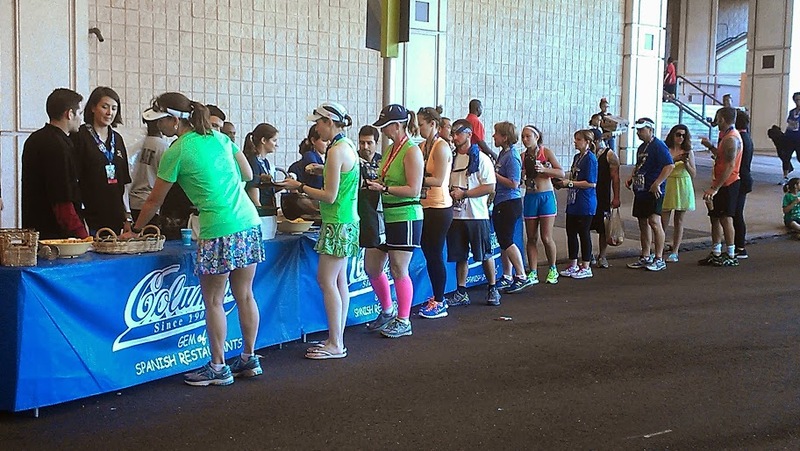 I always find the best running gear there and tasty samples too. During this year’s visit, I purchased some brand-spanking new magnets which I think are so me. 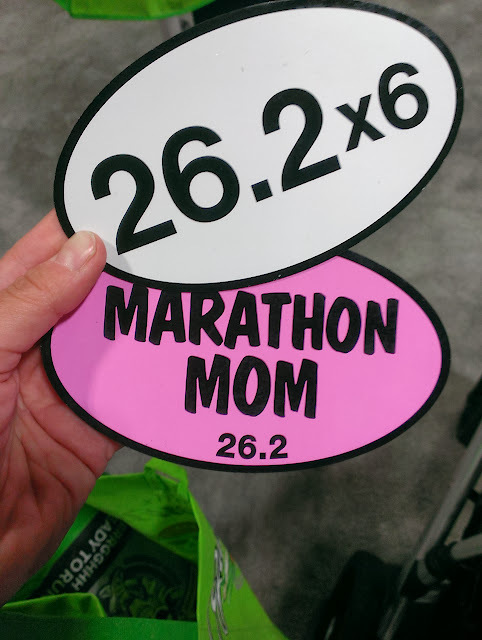 The sticker man said when I finish marathon number seven, it’s free. I’m totally holding you to that at Space Coast, Sticker Man! I also bought some Brooks “run happy shorts” that are also so me and a new Sugar Skull tank from Ink n Burn. I certainly could have spent more money at the expo . I especially would have loved to meet Burt Yasso and have him sign my race bib, but I was on borrowed preschooler time and time was up! On Saturday, Allana arrived at the Ft. Brooke parking garage around 6:00, but I didn’t realize it was cash only. I begged the attendant to let me park and find an ATM and I promised to return with the money. Allana and I walked to the Hilton around the block with an ATM in its lobby. A few minutes later, we were back at the garage and I paid the Adrianne the attendant. I even tipped her for allowing me to “break the rules”. 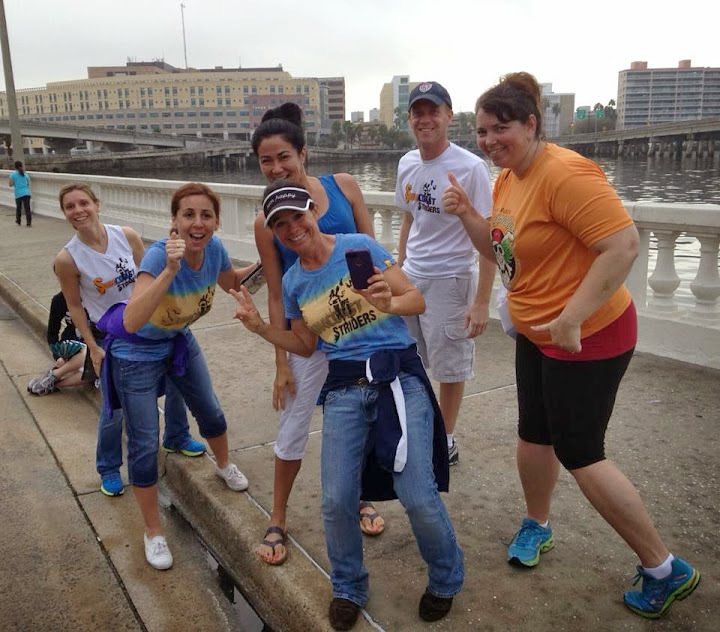 We were still early for the 15K, but we were behind schedule to meet the Suncoast Striders for the annual group photo. As we walked upstairs to the second level outside the expo, we found the Striders huddled together taking multiple photos. Allana and I jumped in just in time. 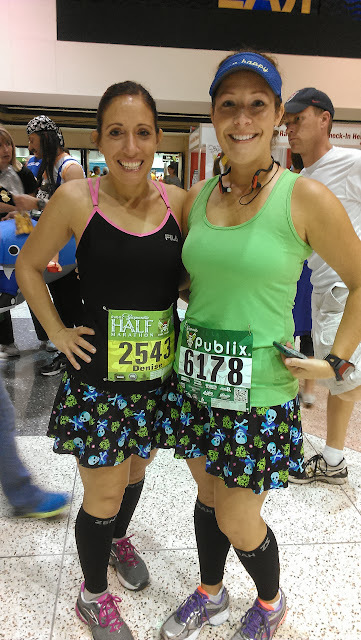 I also realized that Chrissy and I were all matchy-matchy in our Black Pearl sparkle skirts running skirts. Since the 5K start was two hours after the 15K, Allana joined the Strider cheerleading squad to kill the time while she waited for me to finish my race. 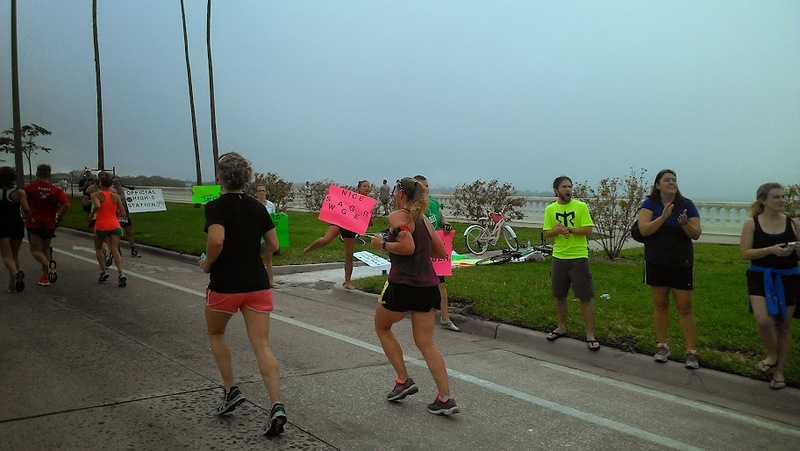 The cheering squad would position themselves around mile one as the rest of the gang headed to the 15K start. While we waited at the start, we took the usual start line photos and stretched. It was then that I realized I forgot my headphones. Thankfully, the band of misfit pirates would keep me entertained during the race. Pirates Mike and Bob handed me some booty to share with the scallywags in the way of a few coins to toss at unsuspecting spectators along the course. This year, the start line was set back further down Brorein Street, which I liked and it has nothing to do with USF (my alma mater) being in the background. 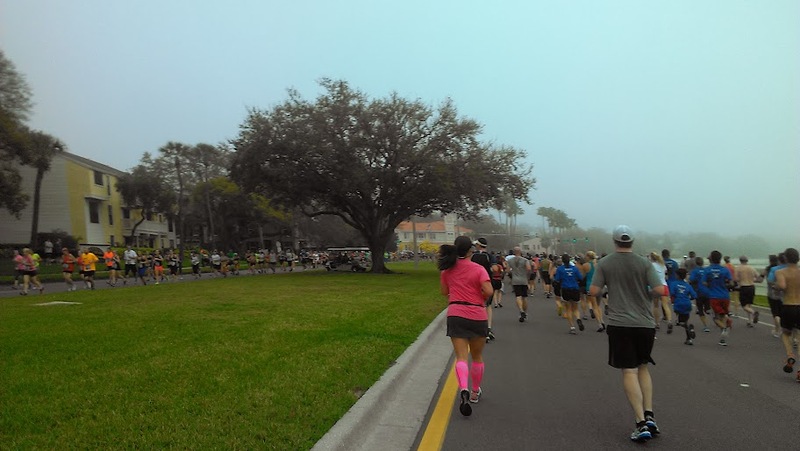 Like in other years, the Saturday race day was humid and the temps hovered around 70 degrees. A thick fog blanketed the buildings and didn’t offer much to cool us off. Once the 15K was under way, I tried to maintain an easy pace at the start. 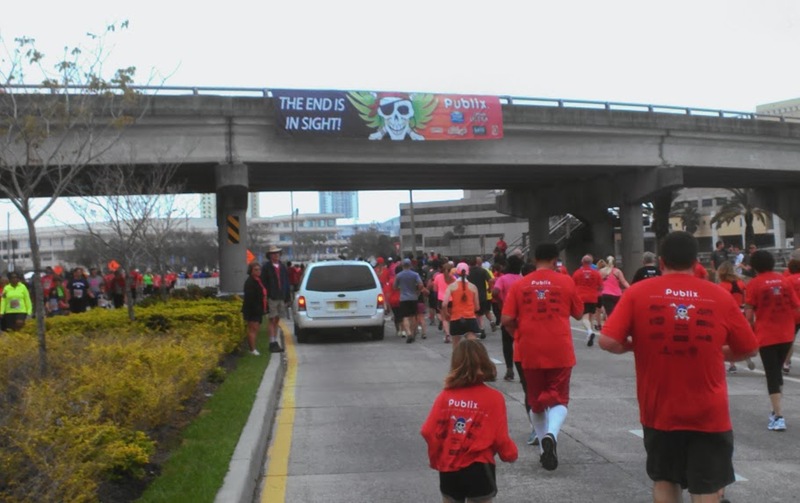 The Gasparilla starts are always a bit congested in the beginning with bottlenecks until the first mile. About a half mile into the race we crossed a drawbridge and the metal grooves always mess with my footing. The thick humidity and saturated air made the bridge wet and even more slippery as we ran across it. Like always, the crowd cleared around mile one as several runners stopped for water at the aid station. I felt good so I kept moving on. Lately, I seem to be able to run three miles without a need for water, so I tried to keep habit in place for this race. 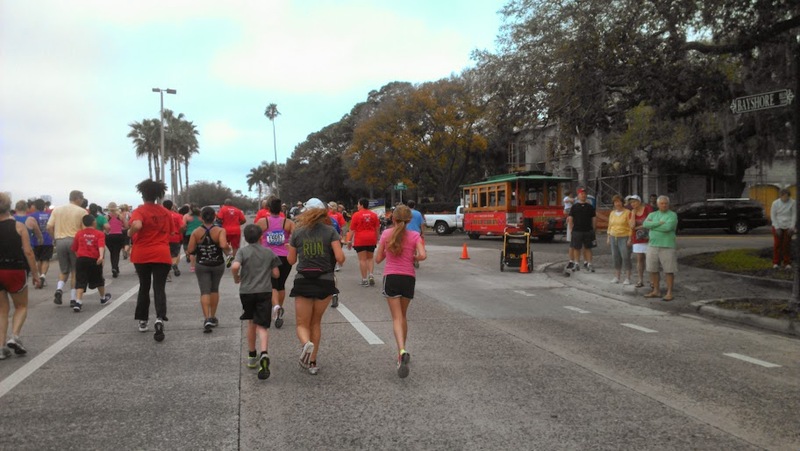 With music provided by several DJs on the course and the Rough Riders and their trolley car parked at mile 3, I never missed my music. Not having music also allowed me to eaves drop and chat with random strangers to take my mind off the course. Near the turnaround, I found my fellow NYC marathoner, Jen G, who confessed about her and husband’s 15K competition. Since she had fallen behind, Luke was winning their little martial rivalry. Speaking on rivalry, I had a bone to pick with the 10:00 mm pace group. They were running ahead of pace. See, this is why pace groups stress me out. I even told him I didn’t like seeing him ahead of me and sarcastically advised him to walk more water stations to slow down. I don’t think he followed my instructions. Around mile five, we happened upon the Krispy Kreme volunteers, but it was too hot and humid to enjoy their little doughnut delights, although I did stop to savor the moment with a click. Since I stopped for a brief second, it seemed like a good opportunity to grab some water and cool off under the sprinklers. With only four miles left, I pushed it to the finish. Around mile 7, I passed Running for Brews and their funny signs and spotted my friend, Brian. With less than a mile left, I passed Allana and the Striders cheering squad. Incidentally, I finished ahead of the 10:00, in case you missed my average pace. 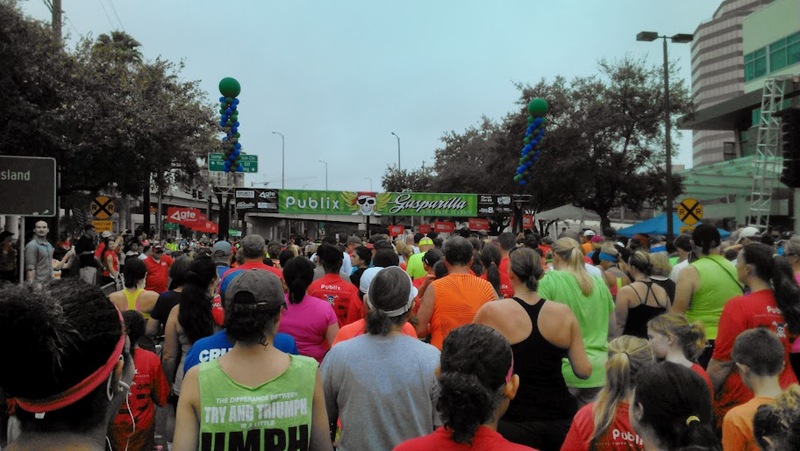 I also shaved nearly 15 minutes off my previous Gasparilla 15K time, a PB-PB (personal best – post baby) but still not a PR. Regardless, I celebrated my achievement with another photo with the Striders and Nanci. Once I crossed the finish line, I took a photo of my new medal and bumped the cheering squad on the bridge. 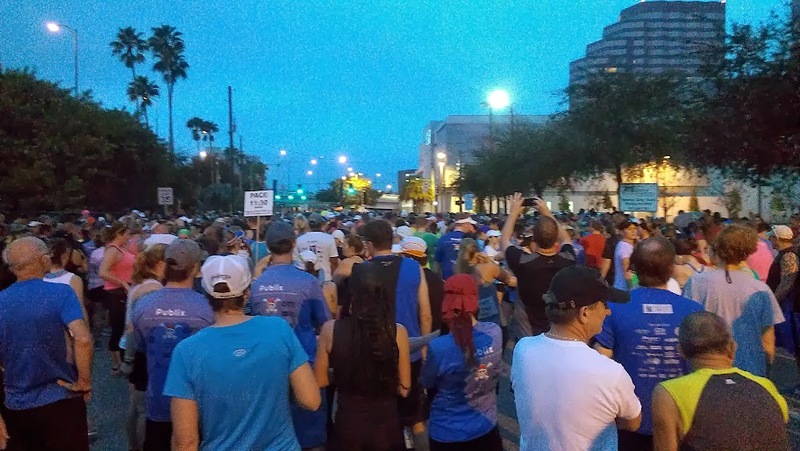 After I used the restroom, Allana and I headed to the 5K start line, which was in the same place as the 15K start. 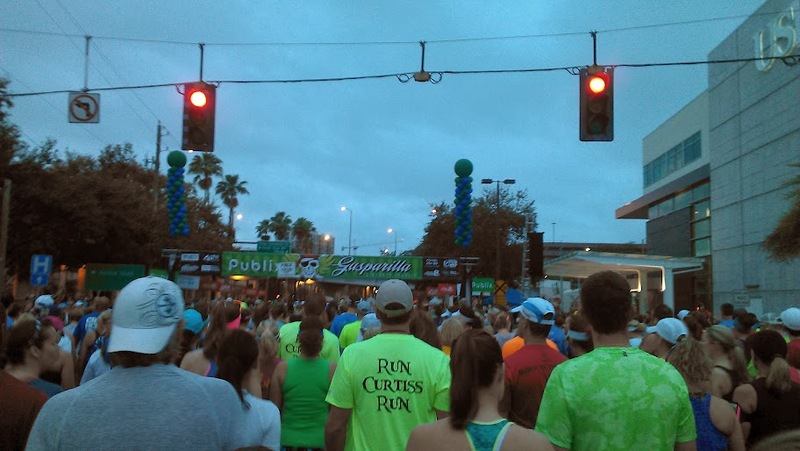 Four years since my last Gasparilla 5K experience, I had forgotten how crowded the 5K start was. Allana and I couldn’t even enter the corral and had to wait for the race to begin before moving into the corral. 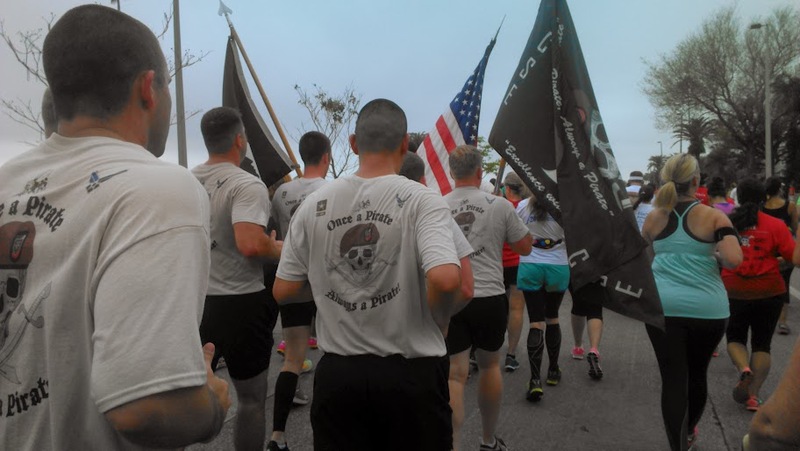 A thick crowd prevented us to pace and we started off with a much slower than normal pace. As we weaved through walkers, we picked up the pace to about 13:00 mm, but Allana felt it was too fast. 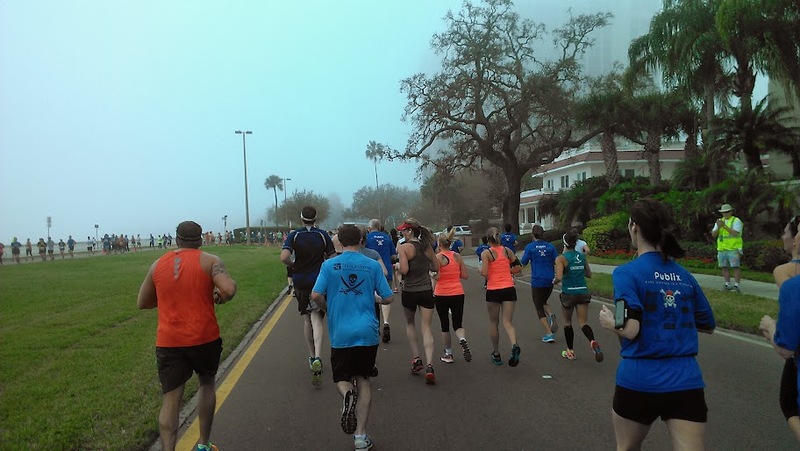 Eventually, we caught up with Chrissy and her dad, who was running his first Gasparilla 5K. We played cat-and-mouse with them for the next few miles. 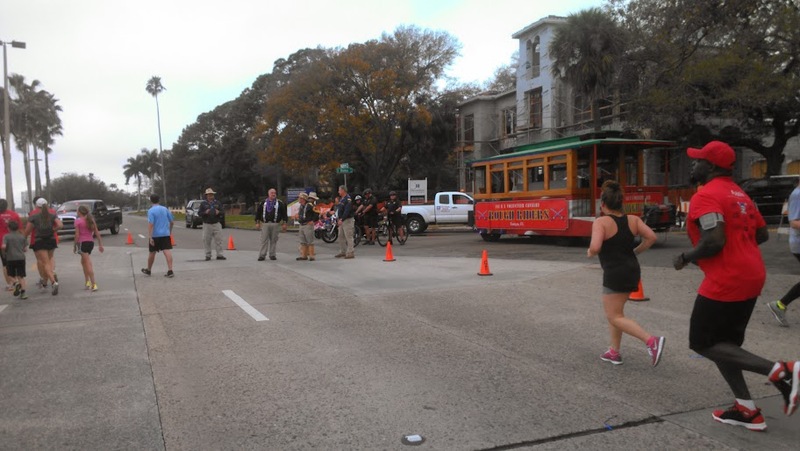 Once again, we passed the Rough Riders and their groovy music blasting from the trolley car. Then, in the distance we heard the cavalry coming up from behind us. Soldiers running in formation passed us chanting army calls. 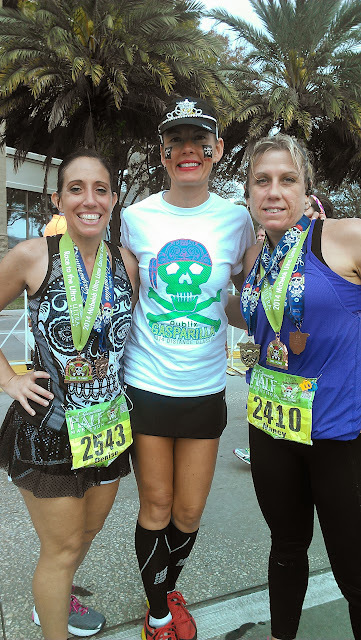 I remembered than from my last Gasparilla 5K and how I loved running beside them and pacing with them. Allana didn’t share my enthusiasm, though. The humidity was really getting to Allana and she started to feel dizzy. We walked a little more than usual to help combat the heat. Between the heat, dizziness and the touch of some kind of bug, Allana didn’t PR and that’s o.k. I’m proud of her for getting out there and running! 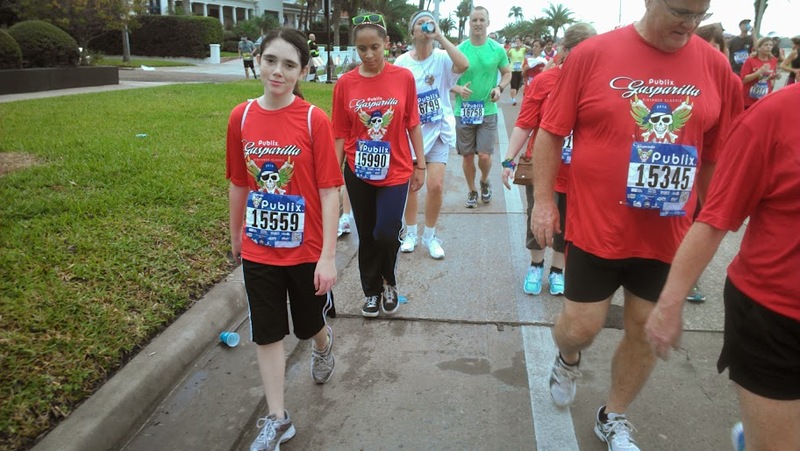 Once we crossed the finish line, Allana earned her first Gasparilla medal and some much needed bottled water. 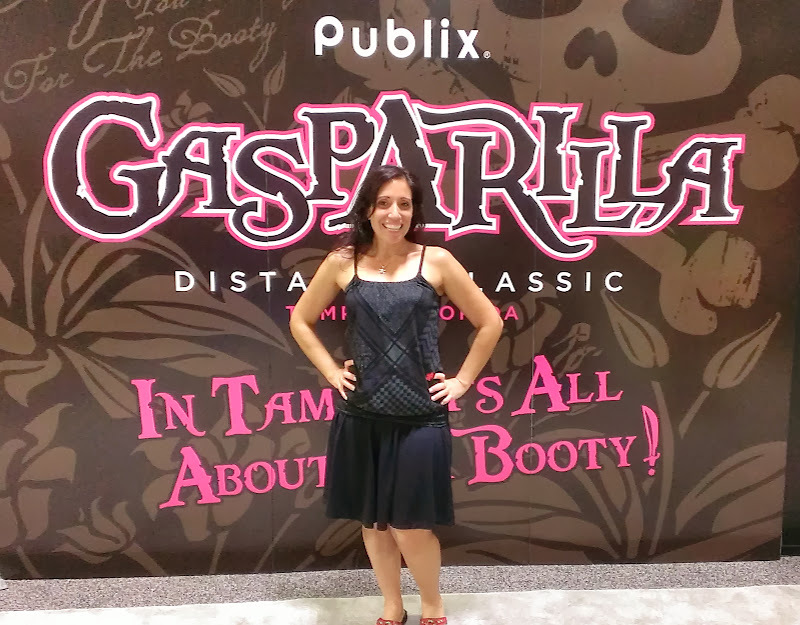 After the race, Allana wanted to explore the expo, especially the Gasparilla wall of fame. 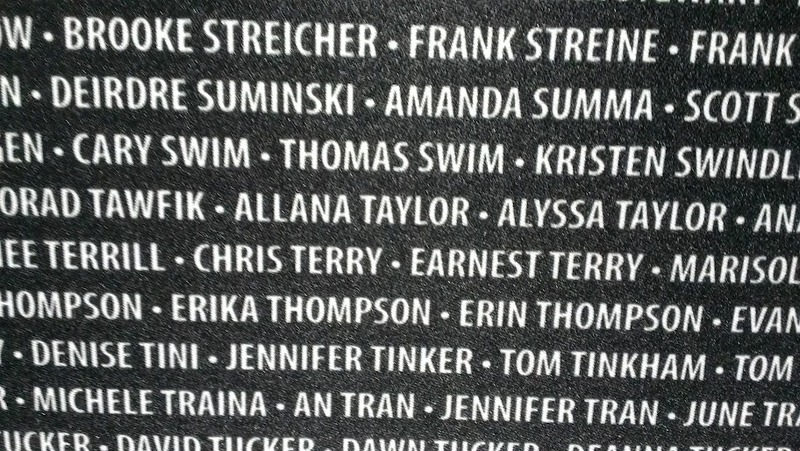 The names on the wall are always a highlight for everyone and Allana was no exception. 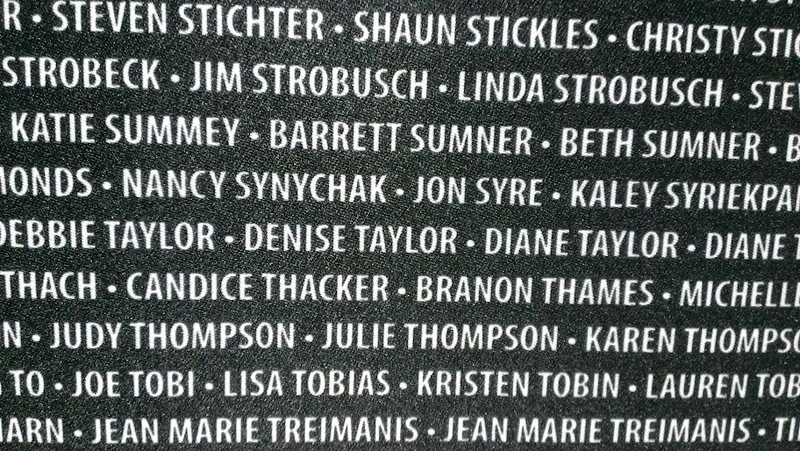 She loved seeing her name listed as the first Taylor. The names are typically listed in alphabetical order, but I found a few strategically placed names by the skull. These are the names of the race directors and the board. 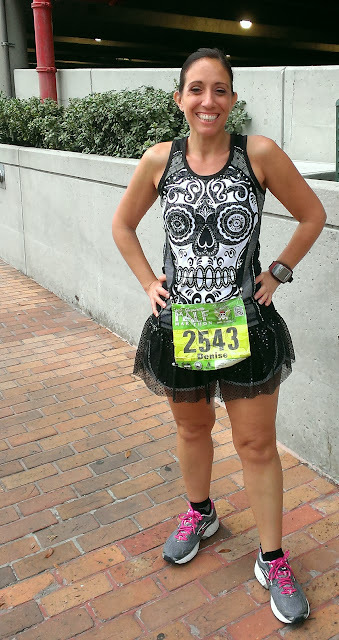 On Sunday, I returned to run the 8K in my new Sugar Skull Ink n Burn tank and my black sparkle skirt. I loved my outfit so much, I asked a random stranger to take my photo. Thankfully, the weather was much cooler with a slight breeze. On my way to the convention center bathroom, I bumped into so many friends and of course, we had to capture the moment. Meghan had just finished the half marathon and earned a new PR. 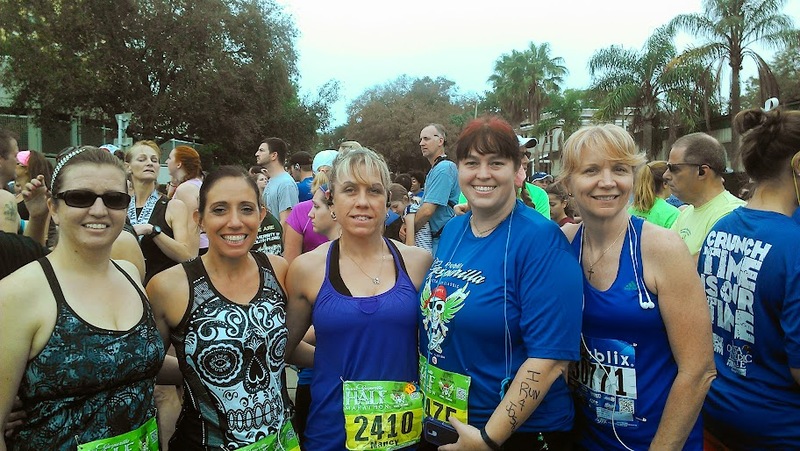 Nancy, Nanci, Tara and a new friend, Kelly set on our course for the 8K start. 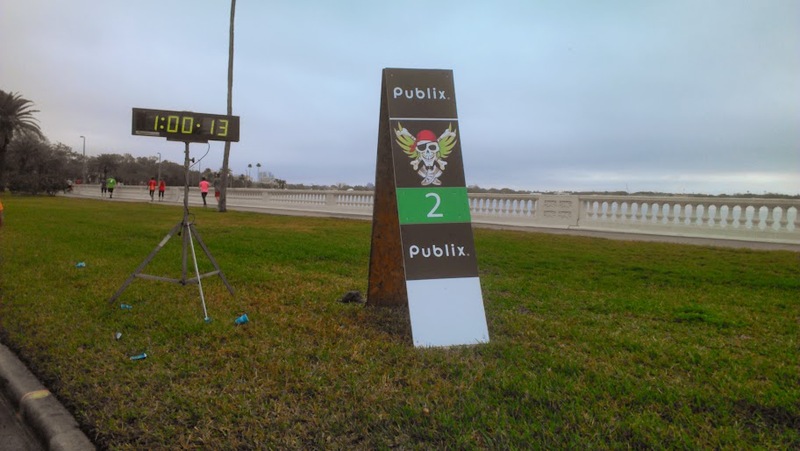 For Sunday’s races, the start line returned to Platt and Bayshore. Honestly, I had not goal set in mind for this race. I had ran several 5 milers before, so anything under 50 minutes would be fine by me. With that in mind, I strategically moved ahead of the crowd closer to the 10:30 pace group. I have to confess, I was a bit nervous racing two days in a row a week after finishing a marathon. 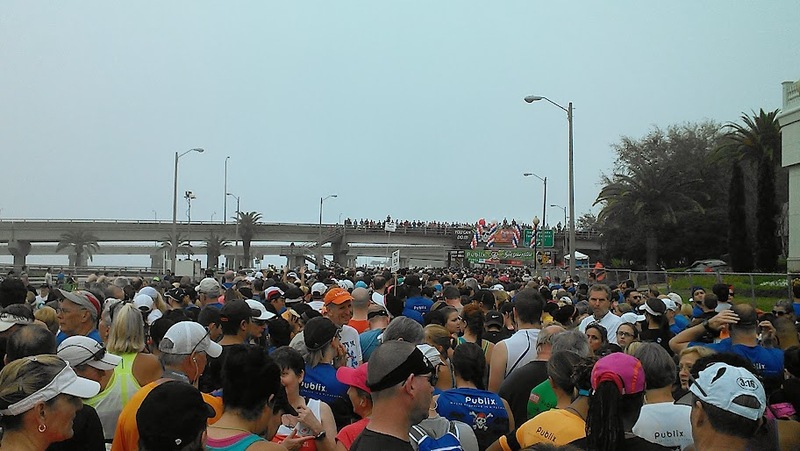 Once the race was underway, I noticed a lot of walkers in this particular race, much like the 5K. I suppose, an 8K is the next step for an avid 5K runner/walker, but for a runner, it’s really frustrating to have to weave between runners. I reminded myself that forcing myself to move slightly slower was a positive thing. Embrace the slower pace. Like clockwork, a ton of people stopped at first mile aid station. With the crowd dispersing, I was able to push through and gain some speed. Before I knew it, I passed the Rough Riders in their favorite three mile spot and then the four mile turn came quickly after that. Thankfully, I had my music for this race. 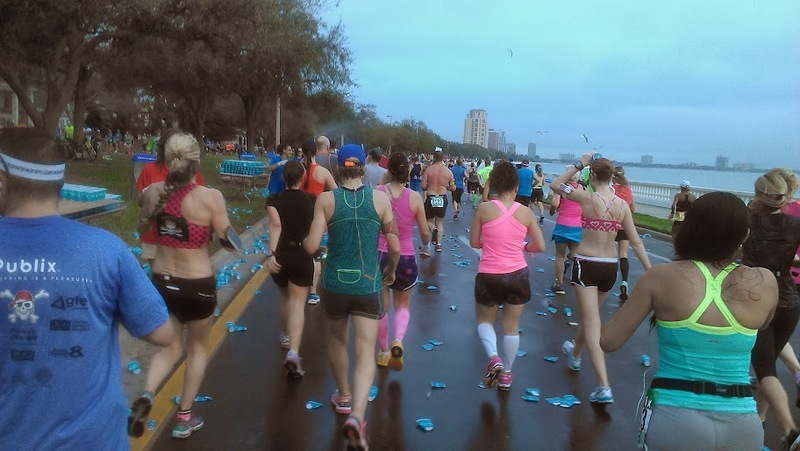 I found my groove as I pushed through the miles, not worrying about my pace. Then, my friend, Jarrett, spotted me on the course and we ran for a bit until the next aid station. We parted ways when I stopped for a quick swig of water. As I got my head back into the race, this little girl came out of nowhere. I called her “Little Oympian” because she had this amazing stride. Before I knew it, I passed the Running for Brews gang again. 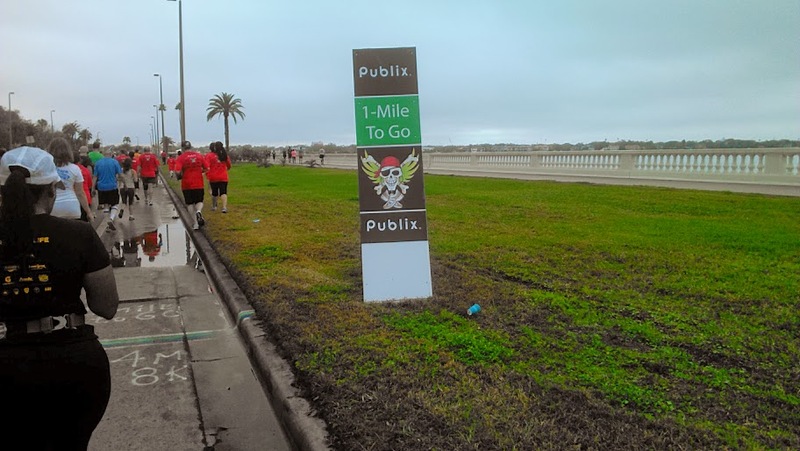 With less than mile left to go and no Gasparilla banner hanging on a bridge to remind that today, I pushed it to the finish. As I started to sprint, I passed the Little Olympian. “C’mon now. You can’t let me beat you!” I shouted at her and then she sprinted ahead of me. I never saw that little gold winner again. 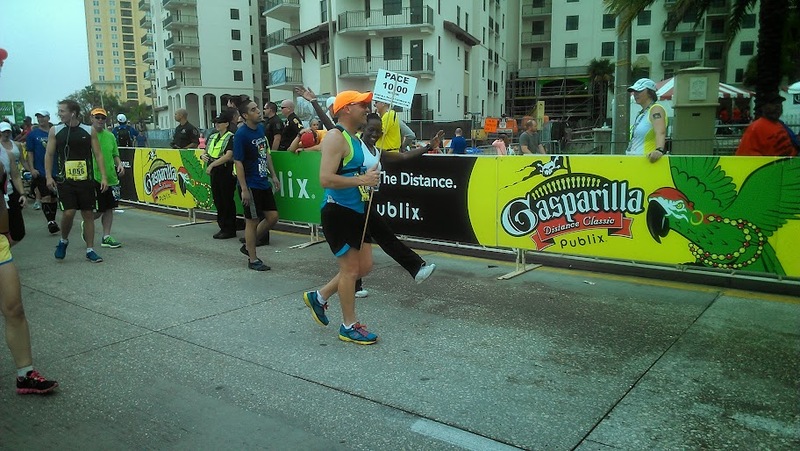 When I crossed the finish line, I noticed I passed the 10:00mm pace group and I had a moment. I felt like I came full circle. 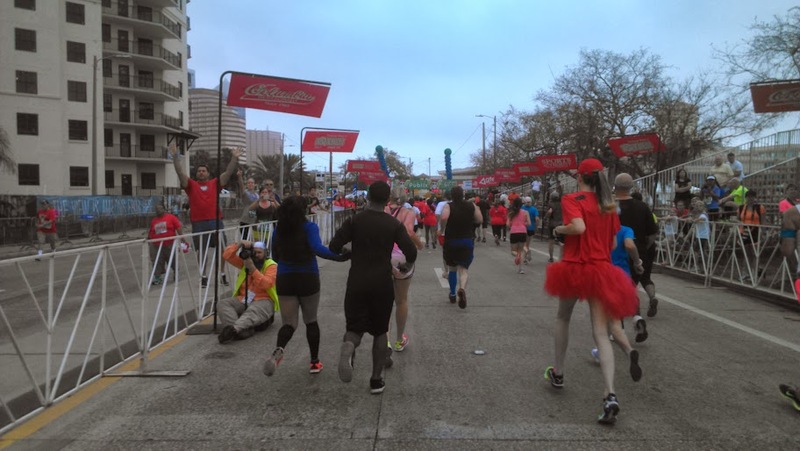 As I gleamed in my Gasparilla moment, I decided to wait for Nancy to cross the finish line. While I stood at the side line, I saw so many friends: Kris and Run Jodi, best known for her famous 600 mile run to meet Nevaeh, her lovely “I run for…” match. Nevaeh may be her angel match, but I was all matchy-matchy with Run Jodi. When Nancy crossed the finish line, she had a moment too and I was so glad I waited for her because she needed a hug! Once we claimed our Lime Cactus medals, I passed another familiar face, Miranda, a.k.a Rainbow Brite from the Best Damn Race. It was so great to see her volunteering at yet another race. 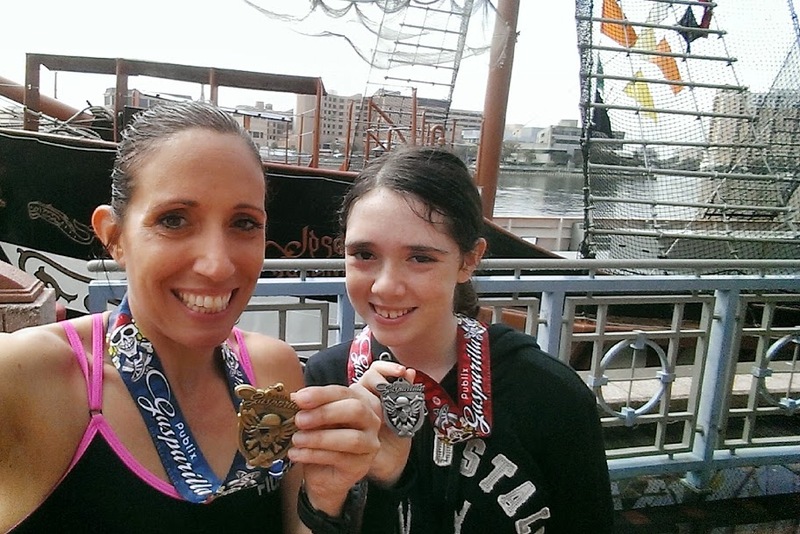 Of course, we had to take the obligatory Gasparilla pirate photo. 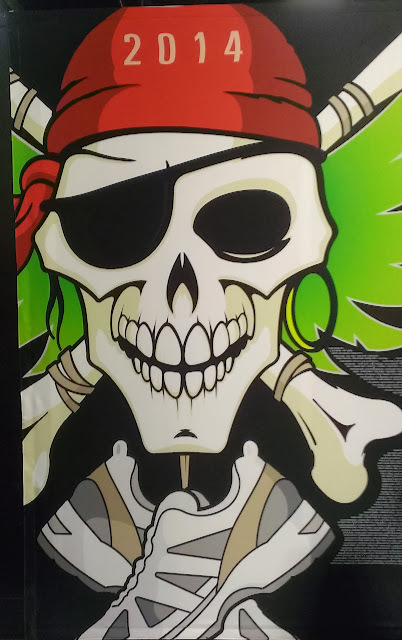 I told my pirate he looked like Tim Curry of The Rocky Horror Picture Show. He liked the obscure reference, but then what would you expect from me? As we moved along the bridge to the post-race party, we found some Girl Scouts having their own post-race party. 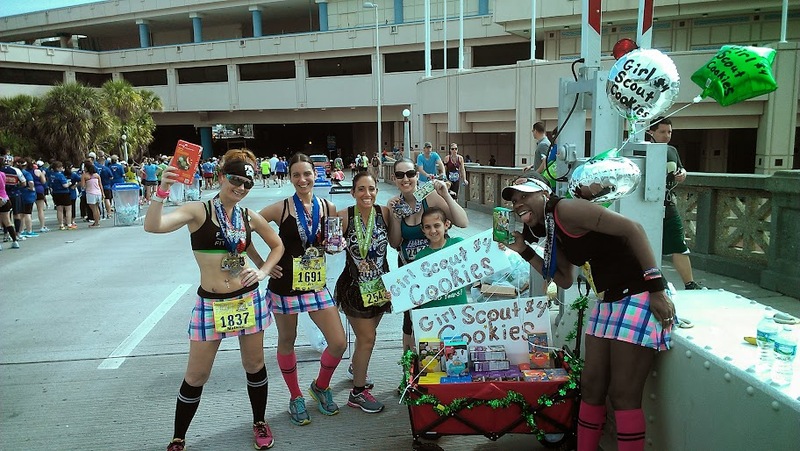 What clever mom to sell cookies to hungry runners! 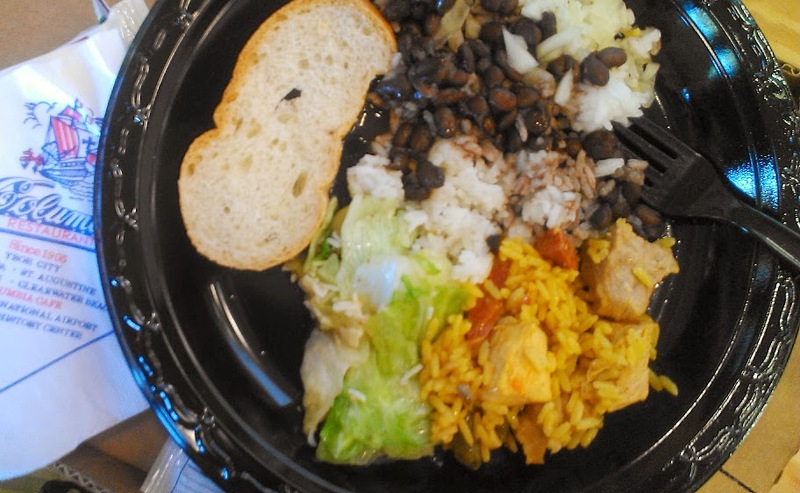 But I was more excited for the Columbia restaurant food! Yum! The food almost tasted as sweet as the three medals I earned. I honestly loved the Mic Ultra Lime Cactus Mini-Challenge. 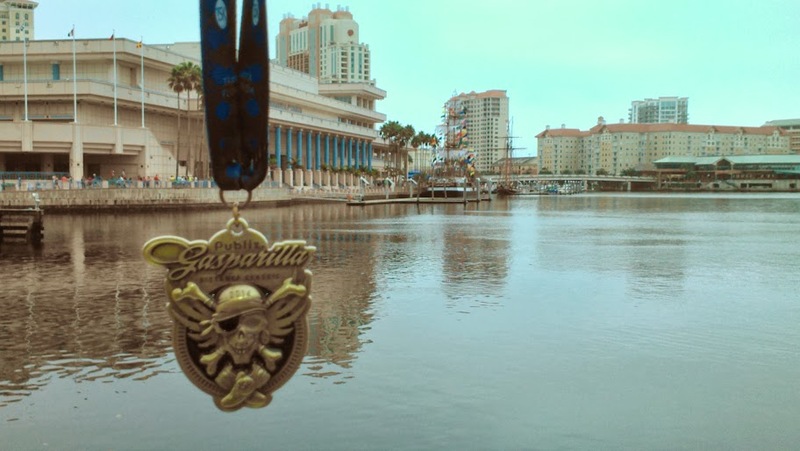 It was nice little stepping stone in the realm of the Gasparilla challenge races and I would totally run it again. Or maybe I’ll decide to go for the Mic Ultra Amber Challenge next year instead. 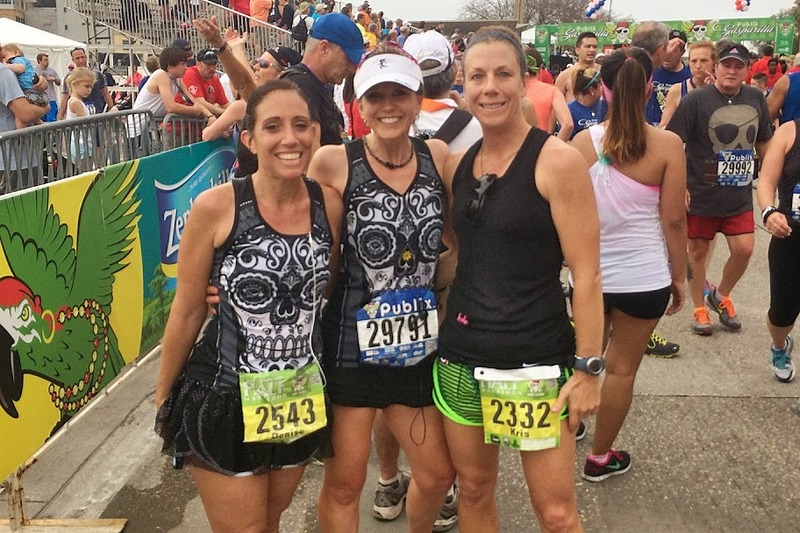 This entry was posted in fitness, fun, Life, running and tagged 15K, 5K, 8K, fitness, friends, fun, Gasparilla, Gasparilla Distance Classic, health, Life, Mic Ultra Lime Cactus Mini-Challenge, musing, pirate, race, recap, review, Run DMT, running, Tampa, thoughts. Being my 1st run, I had no idea what to expect. I had a blast. Thank you for including me in your story ! 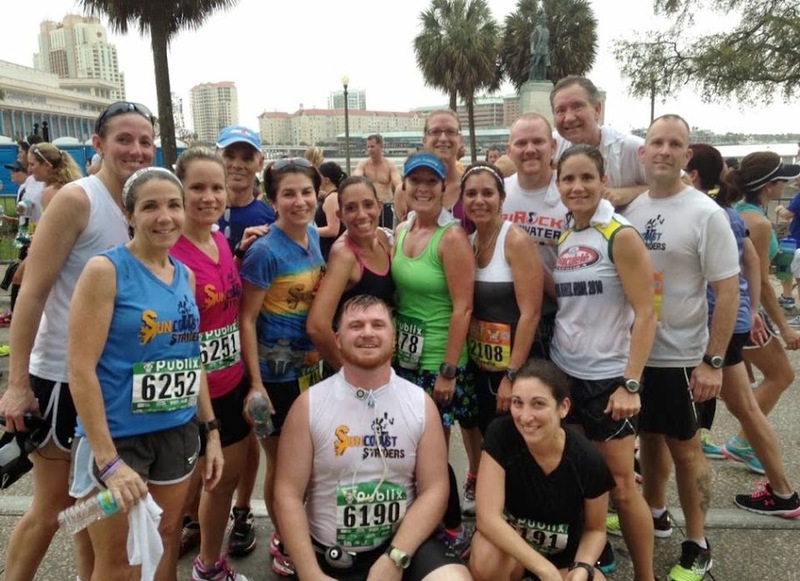 Definitely will run Gasparilla again !!! Great write up Denise…Ou part of the world’s a better place because of your energy, experiences and attitude! Kudos, on the Lime Cactus Mini-Challenge!